Nie, S., Yao, S., Wang, S., and Qin, C. (2016). "Absorbable organic halide (AOX) reduction in elemental chlorine-free (ECF) bleaching of bagasse pulp from the addition of sodium sulphide," BioRes. 11(1), 713-723. A laboratory investigation was developed to confirm and to quantify the reductions in absorbable organic halide (AOX) discharge when sodium sulphide was added during elemental chlorine-free (ECF) bleaching of sugarcane bagasse pulp. After the chlorine dioxide bleaching stage, the pulp was sent directly into the extraction stage without washing. FTIR was employed to determine the breakage of chemical bonds in the pulp, and GC-MS was used to measure the composition of the bleaching effluent. The addition of sodium sulphide caused a reduction in AOX of up to 46.7%. The AOX reduction reached this maximum when the sodium sulphide was added 30 min after the start of the extraction stage and when the pH was higher than 12. FTIR spectroscopy showed that the phenolic lignin of the pulp was degraded by the sodium sulphide and that the syringyl lignin and C-O-C, C=O structure of the pulp holocellulose of the pulp was preserved during the extraction stage. The GC-MS showed that the chlorobenzene and chlorophenol contents decreased noticeably after the addition of sodium sulphide. With the increase in environmental pressures and increased controls over the discharge of carcinogenic compounds, the adoption of cleaner bleaching technologies such as elemental chlorine-free (ECF) bleaching and total chlorine-free (TCF) bleaching are being used more often to reduce the production of chlorinated organic compounds. However, adsorbable organic halogens (AOX) are still generated during the ECF bleaching process (Stratton 2001; Nakamata et al. 2010). AOX contain more than 300 different organochlorines, and some compounds of AOX are classed as recalcitrant chemicals, which persist for long periods of time in the environment (Suntio et al. 1988; McKague 1988). Some AOX compounds are toxic and show a tendency towards biological accumulation because of their lipophilic nature (Reeve 1995). Most of these compounds are proven mutagens and endocrine-disrupting chemicals (Earl and Reeve 1990). Over the past 20 years, researchers in this field have implemented many strategies for improving the ECF bleaching processes, with the aim of decreasing AOX formation. AOX compounds are generated during the in situ generation of hypochlorous acid, as the chlorine dioxide is reduced via the transition from the +4 state to the -1 state (chloride) (Reeve and Rapson 1980; Ni et al. 1992; Ni et al. 1994; Tarvo 2010; Tarvo et al. 2010). This chlorine atom combines with the organics in the fiber, and the chlorinated organics are oxidised to form small molecules (Khristova et al. 2006). Many researchers are beginning to focus on the operating conditions of bleaching, especially the initial bleaching stage, with the aim of reducing the production of active chlorine during the bleaching, which would help to reduce AOX formation (Shatalov and Pereira 2007). The combined use of existing and new development technologies, such as extended delignification, oxygen delignification, enzyme processing, improved chlorination, and alkali extraction, together with the use of oxygen and hydrogen peroxide, could reduce AOX formation (Barroca et al. 2001). Milosevich and Hill (1992) employed caustic soda to neutralise the kraft mill bleach plant effluent to pH 7, and they found that the AOX formation could be reduced by up to 30% under such conditions. Sun et al. (1989) found that harsh oxidative treatment could remove 70 to 80% of the high-molecular weight chlorolignin AOX fraction. Sodium sulphide can be easily dissociated to produce a hydrogen ion (OH–), sulfur ion (S2-), and sulfur hydrogen ion (HS–) in aqueous solution. Because the nucleophilicities of S2- and HS– are stronger than that of OH–, adding sodium sulphide during the extraction stage could promote the degradation of residual lignin and macromolecule chloride lignin and thereby decrease the formation of AOX during ECF bleaching. Sugarcane is a fast-growing crop, and there is little difference between the chemical compositions of bagasse fiber and wood fiber (Hamzeh et al. 2013). Depithed bagasse can be used directly in pulp and papermaking, which is a better application for bagasse than in the past (da Silva et al. 2013). Compared with all of the non-wood fibers used in papermaking, bagasse is considered to be the most valued raw material. Although the silicon content of bagasse is higher than wood, it is much lower than the other grass fiber raw materials, and therefore it should incur no alkali recovery difficulties (Chandra 1998). In this study, bagasse pulp was employed as the raw material and the ECF bleaching process was improved through the addition of sodium sulphide during the extraction stage. FTIR and GC-MS were employed to analyse the bleached pulp and bleaching effluent, respectively, with an eye to the reduction in formation of AOX during the ECF bleaching and the determination of the best methods for this reduction, which will pave the way for the future studies of AOX formation. Unbleached bagasse pulp came from a pulp mill in Guangxi, China. The pulping process conditions were as follows (Nie et al. 2013): sodium hydroxide, 15%; AQ, 0.05%; liquid ratio, 1:4.5; maximum temperature, 155 °C; temperature rise time, 120 min; holding time, 40 min; resulting yield, 59%. The kappa number of the pulp was 11.54; the brightness was 40.51% ISO, and the viscosity was 1349 mL/g. Sodium sulphide was purchased from Accela ChemBio (Shanghai, China). Activated carbon and ceramic cotton were purchased from the Analytik-Jena Instrument Company (Jena, Germany). Sodium chlorite, hydrochloric acid, sodium hydroxide, sulfuric acid, potassium iodide, and sodium thiosulfate were all of analytical grade, purchased either from KeLong Chemical (Chengdu, China) or from Chuandong Chemical (Chongqing, China). The bagasse pulp (10 g, bone-dry) was placed together with a certain amount of deionised water into a plastic bag. Sulfuric acid was added to adjust the initial pH to the range of 3 to 4. Once the reaction temperature had been reached, chlorine dioxide was added to the pulp slurry and a timer was started. The reaction unit was rapidly sealed and shielded from light exposure. The reaction was allowed to progress 10 min beyond the point at which the reaction temperature had reached its set point. The reaction temperature was held constant when bleaching; the amount of AOX in the bleaching effluent was monitored by a regular sampling of the reactor during bleaching (Nie et al. 2014b). A Multi X2500 AOX analyser (Germany) was employed to determinate the AOX content of the bleaching effluent. The basic method and process was based on our previous studies (Nie et al. 2013, 2014a, b): bleaching effluent was passed first through the activated carbon column, where the organic chloride of the bleaching effluent was adsorbed by the activated carbon column. Sodium nitrate was then used to wash the adsorbed inorganic chloride out of the activated carbon column, and the activated carbon column was burned in a combustion furnace, while the content of the AOX was calculated using the micro-coulomb titration method. FTIR spectra were recorded using a Perkin Elmer BXII spectrometer (USA) with the detector set at 4 cm−1 resolution and at eight scans per sample from 650 to 4000 cm−1 (Liu et al. 2012). Pulp samples (2 mg) were mixed with 200 mg of spectroscopic-grade KBr and pressed under a vacuum to form pellets. Two specimens of the samples were tested, and the results were averaged (Yao et al. 2015). A certain amount of bleaching effluent was taken, and its pH was adjusted to 12. The effluent was continually extracted by the methylene dichloride for 8 h, and the organic phase was taken out. Another amount of bleaching effluent was taken and its pH was adjusted to 2. The effluent was continually extracted by the methylene dichloride for 24 h, and the organic phase was taken out. These two kinds of organic phases were combined and dehydrated. A certain amount of hexyl hydride was added in the organic phase, and concentrated to 1 mL under reduced pressure for GC-MS analysis. The samples was injected, at a split ratio of 14:1, into a gas chromatography analyzer (6890 N, Agilent, USA) coupled to a 5973 N mass spectrometer. A capillary column of film thickness 30 mm × 0.25 mm × 0.25 mm was employed. The temperature of the injection port was 250 °C, and the temperature of the interface was 230 °C. The column pressure was maintained at 50 kPa, and helium gas was used as a carrier gas at a rate of 15 mL/min. The oven temperature program was set at 80 °C for 2 min, then increased at a rate of 5 °C /min to 220 °C, followed by 10 °C /min to 280 °C, then held for 5 min. The oven pressure was increased from 50 kPa to 100 kPa at a rate of 1 kPa/min, resulting in a 42-min ramp time. Mass spectra were recorded at 2 scan/s under electron impact at 70 eV; the mass range was 29 to 500 m/z; the voltage of the detector was 1.2 kV (Qin et al. 2015). After the first chlorine dioxide bleaching stage (D0 stage), the bagasse pulp was sent directly to the extraction stage without washing. Three pulp samples were taken at the same time for use in three separate experiments. The initial pH values of the extraction stages were maintained at 3.1, 6.9 and 12.3, and the dosages of sodium sulphide used were 0.25%, 0.5%, 1%, 1.5%, and 2% of the pulp weight. All samples were given the same 2-h, 70 °C treatment. Figure 1 shows that the AOX reductions obtained by sodium sulphide addition up to 2% of the pulp weight. It can be seen that, under the acidic conditions, the AOX reduction reached 21.3% when the dosage of sodium sulphide was 1% and did not vary with the addition of sodium sulphide. The AOX reduction noticeably increased with the increase in the reaction pH, and under alkaline conditions was able to reach 46.7%. 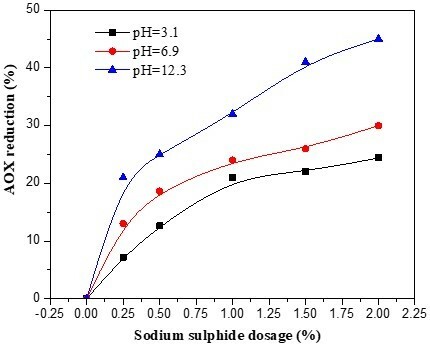 When the dosage of sodium sulphide was 0.25% and the pH 12.3, the AOX reduction reached 21.6%. Under the acidic conditions, the part of the sodium sulphide that was used to neutralise the acid came from the D0 stage, while the AOX was reduced by the redundant sodium sulphide. The large AOX reductions under acidic conditions were a result of the reaction between sodium sulphide and a portion of the AOX in the acid effluent (Milosevich and Hill 1992). In alkaline solution, sodium sulphide can easily be ionized and produce OH–, S2- and HS–. The nucleophilicities of S2- and HS– are stronger than that of OH–, and the substitution reaction will occur between the S2-, HS– and the chloride lignin macromolecule. The chlorine atom will thus be removed and consequently resulted in an AOX decrease during the bleaching. Milosevich and Hill (1992) also found a large initial decrease in AOX in acid effluent in the presence of a 50 mg/L sodium sulphide dosage. AOX continued to decrease at higher sodium sulphide dosages, but at a diminished rate, approaching a maximum reduction of 60%. In alkali effluent, the decrease in the AOX concentration was consistently below 21%, irrespective of sulphide dosage (Milosevich and Hill 1992). Dorica (1992) also found that the simple mixing of chlorination and extraction effluents could result in an AOX reduction of up to 25%. Operating in the pH range of 4 to 11, Dorica (1992) was able to achieve an AOX reduction of 30% to 45% using black liquor (which contains sodium sulphide) as a neutralising agent. Three pulp samples, taken at the same time, were used in three separate experiments. The initial pH values of the extraction stages were maintained at 4.5, 9.8, and 12.7, respectively, for the three experiments. All samples were given the same 2-h, 70 °C treatment, and the dosage of sodium sulphide was 1% that of the pulp. The sodium sulphide adding times were 10, 20, 30, 40, and 50 min after the reaction of the extraction stage had begun. 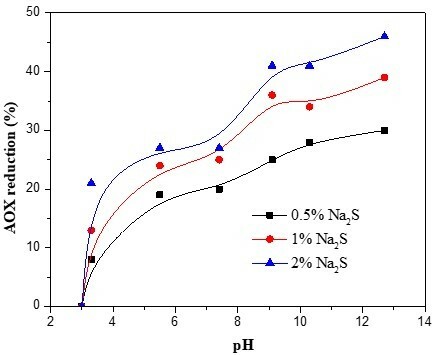 Figure 2 shows the AOX reductions obtained by the various sodium sulphide adding times. It can be seen that the addition of sodium sulphide 30 min after the beginning of the E stage reaction was able to reduce the AOX by 43.7% under alkaline conditions, but only by 16.2% under acid conditions. When the sodium sulphide was added to the extraction stage reaction more than 30 min after its start, the AOX reduction instead decreased. Therefore, the addition of sodium sulphide 30 min after the start of the extraction stage reaction is the best way to reduce AOX. This is because the micromolecule chlorinated lignin from D0 stage precipitates onto the surface of the pulp fibers, most of which could be extracted during the extraction stage (Yang 2001). Dorica found that the AOX could be reduced by 54% and 67%, respectively, through the addition of sodium hydroxide and calcium hydroxide to the softwood chlorination effluents (Dorica 1992). This indicated that some of the AOX compounds from the D0 stage were able to be hydrolysed by the alkaline. From this, it could be concluded that some part of the AOX had actually been degraded by the alkaline when the sodium sulphide was added. Francis et al. also found that the AOX in bleached kraft pulp mill effluent could be reduced in laboratory tests by approximately 30% using an alkaline sulphide chemical treatment (Francis et al. 1997). 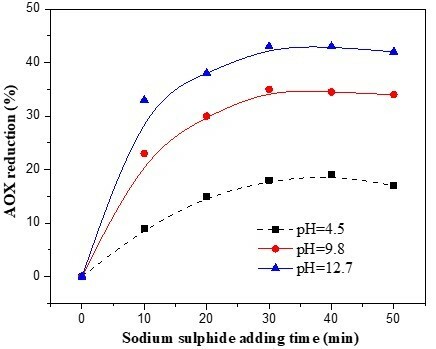 When the sodium sulphide was added too late, for example 60 min after the extraction stage began, the sodium hydroxide was consumed and pH decreased, and the AOX reduction was therefore noticeably inhibited (Fig. 2). Three samples, taken at the same time, were used for three separate experiments, in which the dosages of sodium sulphide were 0.5%, 1%, and 2%, respectively. All samples were given the same 2-h, 70 °C treatment, and the initial pH of the extraction stage was maintained at a value between 3 and 13. The AOX reductions in the sodium sulphide-supplemented effluent were plotted against the pH of the effluent (Fig. 3). As the curves in Fig. 3 show, when the pH was below 6, the AOX reduction increased at a noticeable rate. When the pH was increased above 9, some of the AOX compounds that had not reacted with the sodium sulphide in acid effluent apparently reacted with alkali because the AOX reduction increased in the alkaline pH range. This indicated that the reaction between the sodium sulphide and AOX could have been promoted by the alkaline conditions. Milosevich and Hill (1992) found that the same sodium sulphide and pH effects were evident for a mixed effluent containing 30% alkali effluent; that is, the AOX decrease resulting from the sulphide addition was small. Under neutral conditions, although the addition of sodium sulphide alone to water (without added alkali) was capable of reducing the AOX formation, the AOX reduction remained unchanged when the pH was increased from 6 to 8 (Fig. 3). This was attributed to a finding that most of the AOX that form during the D0 stage are macromolecular chlorides, which do not react easily with sodium sulphide under neutral conditions (Wilson and Holloran 1992). Under alkaline conditions, OH– was abundant, and part of the macromolecular chlorides could be hydrolysed by the OH–, and most of the macromolecular chlorides are oxidized by the S2- and HS– (Yang 2001). Fourier transform infrared (FTIR) spectroscopy was employed to identify the changes to the functional groups of the bagasse pulp occurring during the extraction stage. 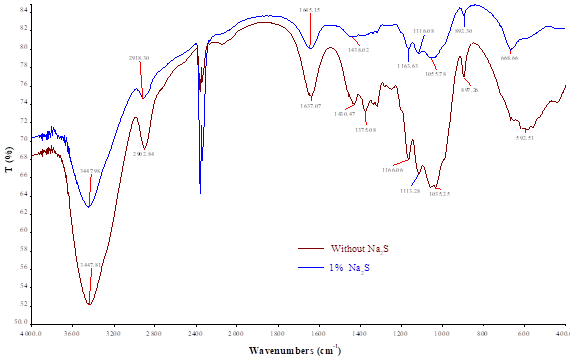 The FTIR spectra of the extraction stage pulps with and without sodium sulphide addition are shown in Fig. 4. The assignments of the observed bands and their relative intensities are listed in Table 1 (Kokkonen et al. 2004; Xu et al. 2011). The band at 3447 cm-1 was assigned to -OH stretching vibration. The relative intensity of this band increased, in comparison to the control pulp, after the addition of the 1% sodium sulphide, suggesting the possibility of that the sodium sulphide-supplemented pulp possessed better physical properties. The band at 1431 cm-1 was assigned to benzene ring vibration and C-H in-plane vibration. Compared with the control pulp, the sodium sulphide-supplemented pulp demonstrated a higher relative intensity at this band. This indicated that removal of part of the lignin structure had been hindered by the sodium sulphide. The band at 1370 to 1380 cm-1 was assigned to aromatic nucleus -OH bending vibration. This bond disappeared in the sodium sulphide-supplemented pulp samples, indicating that the sodium sulphide was effective in removing the phenolic hydroxyl. The bands at 1166 cm-1 and 1035 cm-1 were assigned to carbohydrates. The sodium sulphide-supplemented pulp samples exhibited higher relative intensities than the control pulp samples at these bands, indicating that the carbohydrates in the pulp were well-protected when the sodium sulphide was added during the extraction stage. The relative intensities of the bands at 1113 to 1118 cm-1, which were assigned to the syringyl C-H vibration, decreased after the sodium sulphide addition, reflecting the decrease in the lignin and chlorinated lignin content. The components of the extraction stage bleaching effluent were analysed using GC-MS. The results of the total ion chromatography analysis are shown in Table 2. A large amount of 2,4-dichlorophenol, 1,3,5-trichlorobenzene, and 2,4,6-trichlorophenol were found in the extraction stage effluent that lacked sodium sulphide. These organically bound chlorides were the chief constituent of AOX in the bleaching effluent. Noticeable amounts of pentachloropyridine, dimethoxyphenol, methoxybenzene, ethylbenzene, o-cresol, and benzyl alcohol were also generated. When sodium sulphide was added during the extraction stage, the quantities of 2,4-dichlorophenol, 1,3,5-trichlorobenzene, and 2,4,6-trichlorophenol in the extraction stage effluent decreased sharply. This indicated that, under alkaline conditions, the sodium sulphide had a strong inhibitory effect on the formation of organic chloride, especially the formation of 1,3,5-trichlorobenzene, which was reduced by 86.05%. However, not all compounds of the AOX could be reduced, and the pentachloropyridine content remained unchanged when sodium sulphide was added. With the increase in sodium sulphide content, the content of some lignin-degradation products such as benzyl alcohol, o-cresol, and p-ethylbenzene increased. This occurred when the sodium sulphide became dissociated during the extraction stage, and the OH–, S2-, and HS– all coexisted in the alkaline solution. These three nucleophilic reagents were able to react simultaneously with the chlorinated lignin and residual lignin. The OH– reacted with the chlorinated lignin, breaking the bonds of α-aryl ether and α-alkyl ether of the phenol structure and β-alkyl ether of the non-phenol structure and methyl aryl ether. The breakage of the ether bonds led eventually to the degradation of the macromolecule chlorinated lignin. Because the nucleophilicities of S2- and HS– are stronger than that of the OH–, the substitution reaction occurred preferentially between the S2-, HS–, and the macromolecule chlorinated lignin completely degraded the chlorinated lignin and thereby decreased the formation of AOX (Yang 2001). Some scholars have proposed the theories of “protective effect” and “free radical capture” to characterise the extraction stage after the addition of sodium sulphide. Hägglund (1951) pointed out that the extraction stage reaction is rather complicated and that during this stage, the dissolution reaction of the chlorinated lignin occurs alongside the condensation reaction of the chlorinated lignin. In his study, when sodium sulphide was added during the extraction stage, the SH– reacted with the chlorinated lignin, producing sulfurated chlorinated lignin. Single sulphide and disulphide compounds were decomposed and generated over and over again, which inhibited the secondary condensation of the lignin structure. Kleinert (1976) indicated that free radicals are abundant during the extraction stage and that these are captured by the sodium sulphide. Thus, he kept the chlorinated lignin at a low molecular state so that it could be easily extracted from the fiber. The addition of sodium sulphide during the extraction stage of ECF bleaching was demonstrated to be a practical method of reducing mill AOX discharge. After a two-hour and 70 °C reaction, AOX was reduced by 40% to 50% using this method, and the resultant bleach plant effluent contained a pH of 12. The phenolic hydroxyl structure of the pulp decreased after the addition of sodium sulphide. The production of some AOX compounds, such as chlorobenzene and chlorophenol, was inhibited. These AOX formation reduction mechanisms could help pulp mills meet the AOX formation limits. This project was sponsored by the National Natural Science Foundation of China (B061103), the Guangxi Natural Fund (2012GXNSFAA053023, 2013GXNSFFA019005, 2014GXNSFBA118032, and 2014GXNSFBA118060), and by the research funds of The Guangxi Key Laboratory of Environmental Engineering, Protection, and Assessment (1301K001). The authors thank the Guangxi Key Laboratory of Environmental Pollution Control Theory and Technology for the research assistance. Chandra, M. (1998). “Use of nonwood plant fibers for pulp and paper industry in Asia: Potential in China,” M.S. thesis, Virginia Polytechnic Institute and State University, Blacksburg, VA.
Dorica, J. (1992). “Removal of AOX from bleach plant effluents by alkaline hydrolysis,” Journal of Pulp and Paper Science 18(6), 231-237. Earl, P. F., and Reeve, D. W. (1990). Chlorinated Organic Matter in Bleached Chemical Pulp Production, TAPPI Press, Atlanta, GA.
Hägglund, E. (1951). Chemistry of Wood, Academic Press, New York, NY. Kleinert, T. N. (1976). “Mechanisms of delignification in the oxygen-alkali system,” TAPPI 59(9), 122-124. Kokkonen, P., Fardim, P., and Holmbom, B. (2004). “Surface distribution of extractives on TMP hand sheets analyzed by ESCA, ATR-IR, TOF-SIMS and ESEM,” Nordic Pulp and Paper Research Journal 19(3), 318-324. McKague, A. B. (1988). 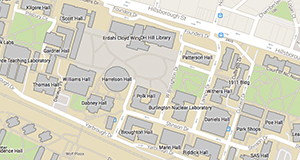 “Material presented at the first colloquium on pulp and paper mill effluents,” University of Toronto, Toronto, ON, Canada. Milosevich, G. M., and Hill, D. A. (1992). “Reduction of AOX in bleach plant effluent by addition of mill process alkalis,” Pulp and Paper-Canada 93(3), 61-68. Nakamata, K., Motoe, Y., Shimizu, S., NakagawaIzumi, A., and Ohi, H. (2010). “Evaluation of chloroform formation at an ECF bleaching pulp mill and its original compound,” 64th Appita Annual Conference and Exhibition, Incorporating the 2010 Pan Pacific Conference, Appita 64, April 18-21, Melbourne, VIC, Australia, pp. 11-16. Ni, Y., Kubes, G. J., and Van Heiningen, A. R. P. (1992). “Rate processes of chlorine species distribution during ClO2 prebleaching of kraft pulp,” Nordic Pulp and Paper Research Journal 7(4), 200-206. Ni, Y., Kubes, G. J., and Van Heiningen, A. R. P. (1994). “Reduction of the formation of organically bound chlorine during ClO2 bleaching,” Journal of Pulp and Paper Science 20(4), 103-106. Reeve, D. W., and Rapson, W. H. (1980). “Developments in chlorine dioxide bleaching,” American Society of Mechanical Engineers 1(1), 403-440. Sun, Y. B., Joyce, T. W., and Chang, H. M. (1989). “Dechlorination and decolourization of high-molecular-weight chlorolignin from bleach plant effluents by an oxidation process,” TAPPI 72(9), 209-213. Tarvo, V. (2010). “Modeling chlorine dioxide bleaching of chemical pulp,” Chemical Engineering Report Series, Aalto University School of Science and Technology. Espoo, Finland. Wilson, D. G., and Holloran, M. F. (1992). “Decrease of AOX with various external effluent treatments,” Pulp & Paper-Canada 93(12), 136-142. Yang, S. (2001). Chemistry of Plant Fiber, China Light Industry Press, Beijing, China. Article submitted: June 8, 2015; Peer review required: October 13, 2015; Revised version received and accepted: November 4, 2015; Published: November 25, 2015.